Little is known about the mercenary Bullseye other than the fact that he never misses. A sharpshooter with super human precision, he is considered one of the world’s top assassins. His true name is unknown. Wearing a costume that can only be described as “on target”, Bullseye makes his Marvel debut! The merc leaves a signature warning for his clients who don’t pay up – proving he can wield a pen with lethal force. With Black Widow on backup, Daredevil takes down Bullseye and some hired goons in an extraordinary, flurried battle. And their fighting ring is an amusement park! Read this now-classic issue. At arguably his most sadistic, Bullseye, under the employ of Kingpin, wields Elektra’s own sais against her. Matt Murdock is forever changed. The moral compass spins wildly out of control as two of Marvel’s most dangerous vigilantes take aim at each other. Artist Steve Dillon delivers on insanity. Under Dark Reign, Norman Osborn assembles a team of Avengers who have strayed as far from the path as he has. 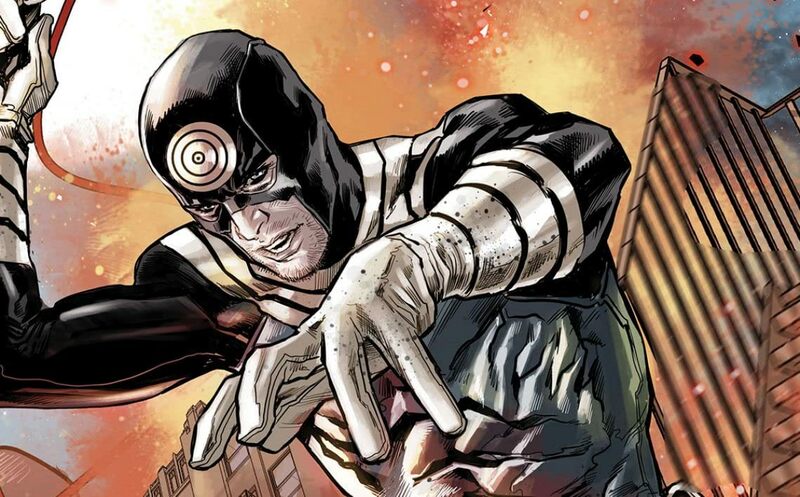 Bullseye is reassigned codename “Hawkeye”, kicking off his “heroic” career. In the near future, reporter Ben Urich investigates Matt Murdock’s dying words. This series opens with one of the most brutal clashes between DD and Bullseye. Don’t miss it.